Former Midland National Life Insurance Company President and Chief Executive Officer (CEO) William A. Rigsbee passed away on May 1, 2017. 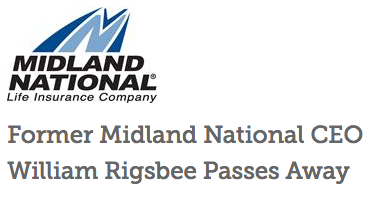 Rigsbee joined Midland National in 1961, retiring in 1992 after serving 31 years at the company. “Bill left an indelible mark on our organization by leading us on a course of unparalleled growth, stability and financial strength,” said Esfand Dinshaw, Chairman and CEO of Sammons Financial Group, parent company of Midland National. “Under his leadership, the Regional Sales Director (RSD) program was established, a system that helped us build our field force, and enabled us to obtain national prominence in the insurance marketplace,” added Dinshaw. Under his leadership, the company increased life insurance policies in force from $275 million to $50 billion; increased assets from $29 million to $4.1 billion; and achieved a compound annual growth rate of 15% while maintaining superior industry ratings and a high quality investment portfolio*. *Midland National internal information, 1961. You can discover the full archives of William A. Rigsbee here on the Midland National Company History site.